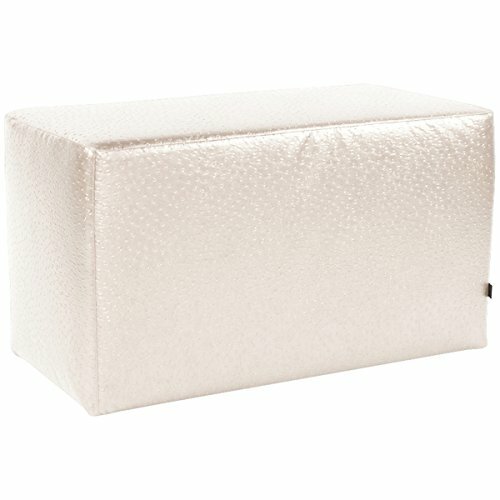 Howard Elliott c130-262 universal bench cover, ostrich pearl. This shimmering faux leather fabric will entice one's fashion senses while adding a futuristic flair to any decor. The simple design of the ostrich bench makes them great to use as side tables, ottomans, alternate seating and more the high-style design and high-end materials in the bench covers are what set Howard Elliott apart from the competition. Howard Elliott’s innovative product line is carefully designed and packaged to ensure low damage rates for their high quality items. Howard Elliott has been redefining the home furnishing and hospitality industry with innovative designs of decorative mirrors, accessories, and occasional furniture since 2001. Lifestyles change the way people live and Howard Elliott’s mission is to create exceptional products which truly finish a room. Howard Elliott distinguishes itself from the competitors with the effortless adaptability of their product line. Versatility, style and customization are just a few of the features built into every item they produce. Howard Elliott's Chicago-land and international manufacturing facilities take pride in their hand-crafted, quality construction. Howard Elliott is constantly refreshing their look with new finishes, fabrics and designs, keeping them ahead of the game. Dimensions: 36-inch length, 18-inch width, 20-inch height.